Following a thrilling action packed opening sequence of an unknown creature emerging from Tokyo Bay and rampaging through the city streets, destroying buildings and forcing people to flee before it, various government departments must work to find out what it is and how to stop it. Their response will determine the fates of millions of citizens. Soon a task force of scientists and experts is set up to discover the nature of the being, led by government official Rando Yaguchi (Hiroki Hasegawa) and his American counterpart, Kayoko Patterson (Satomi Ishihara). Together this team establishes that the creature seems to be radioactive and capable of rapidly evolving. The seemingly indestructible force, that they name Godzilla, continues on its destructive course, putting them in a race against time and raising difficult questions about how they deal with it. 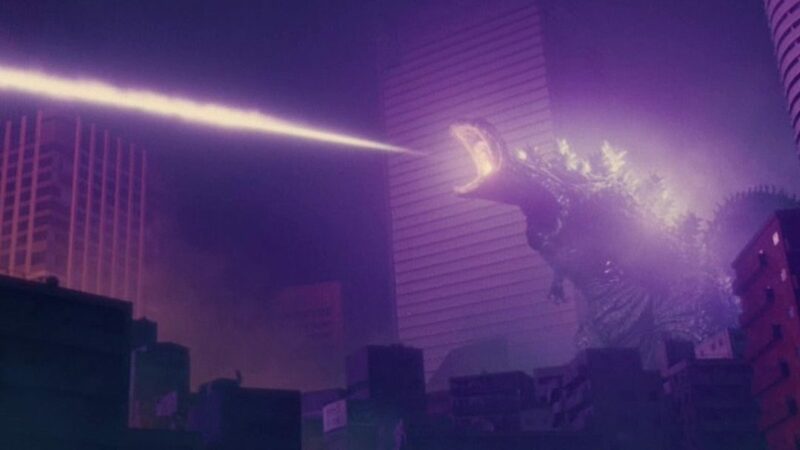 Written and directed by Hideaki Anno (Evangelion, Love and Pop) with additional directing duties for Shinji Higuchi (Attack on Titan), the film wastes no time by getting straight to what people want to see: a giant creature knocking down buildings and terrorizing the population. This opening sequence is a great way to start as it gives the audience no time to settle and draws you right into the crisis rooms where they are scrambling to counter this unexpected catastrophe. Anno’s face paced directorial style works well to create a sense of panic and the script is perfect in evoking high level discussions on military response, scientific analysis, and the political considerations of the prime minister and his team. Throughout the pacing is good, giving us a couple of lulls in the action to establish characters and spell out more clearly what is happening and the import of the decisions they are taking. There are moments of humour throughout though the film never becomes a parody. It has a satirical edge that doesn’t undermine the drama, perfectly balancing a great action film with a more intelligent discussion on various real-world events. A great cast help to bring to life the script and it doesn’t shy away from complex explanations that help establish a sense of realism to the incredible concept. The use of large casts, in conference rooms and in action sequences works well to give the impression that this is something of incredible significance. Rather than a few isolated characters, there are always larger groups of people listening in or reacting to events. The scenes of Godzilla are exciting, increasing in scale and ferocity as the film progresses. Using a mixture of miniatures, practical and digital effects, the filmmakers create some incredible set-pieces, but always with one eye on the human element by cutting back to reaction shots or the smaller scale impact. The film continues the tradition of the original Godzilla by creating an interesting subtext to the action. The monster is discovered to be radioactive, a theme that ties in with Japan’s recent Fukushima nuclear plant disaster. The way that government responds to this threat is especially poignant given the real world correlation. Shin Godzilla also appears to be a pointed attack on government incompetence and conservative mindset (evidenced by their consistent sidelining of a female expert who turns out to be correct in everything she suggests). It praises scientists, experts, and using intellect over raw firepower to overcome Godzilla. As with the original there is a discussion of the use of nuclear weapons, and an even more heavily emphasized consideration of Japan-America relations. It celebrates international co-operations, intelligence, warns of the threat of nuclear power while also acknowledging its benefits, and provides a satire of government inadequacies. However, all of these things tie into the story and are never forced. A fun, intelligent monster movie that succeeds on every level. Spectacular action sequences tempered by thoughtful exploration of the underlying themes.